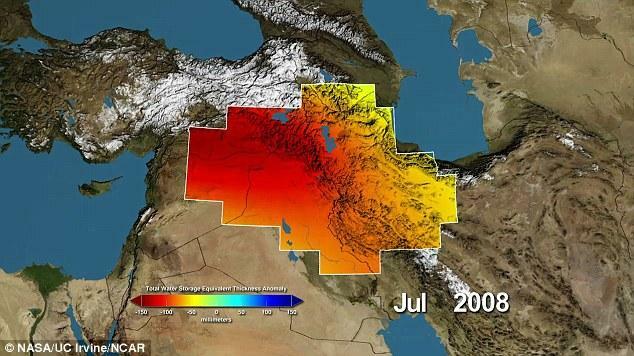 Data collected between 2003 and 2010 from NASA's gravity-measuring satellites (part of NASA's Gravity Recovery and Climate Experiment - GRACE), indicate freshwater reserves in parts of Turkey, Syria, Iraq and Iran in the Tigris and Euphrates river basins had decreased by 117m acre feet, or 144 cubic kilometres over seven years. Scientists warn there could be severe water shortages in decades to come if water resources are not managed better in the region. They say the precious water stocks have gone because of poor water management, increased demands for groundwater, and a major drought in 2007. Scientists say that with climate change, droughts in the region are expected to turn more extreme. Water runoff is expected to decline 10 per cent by 2050, while demand for water is expected to increase 60 per cent by 2045. In a report released during the UN climate talks in Qatar, the World Bank has also concluded among the most critical problems in the Middle East and North Africa will be worsening water shortages. The region already has the lowest amount of freshwater in the world. Learn persistence from this goose!